It all starts with the golden ratio. That’s the 61.8% retracement level. Any move, swing or dip, will see some “unusual” activity around the 61.8% level. If the market can retrace to it, it will have a hard time to break it from the first time. Everyone using Fibonacci’s focuses on the 61.8% level. As a target, they use the Fibonacci extension of 161.8% of the previous five-wave structure. 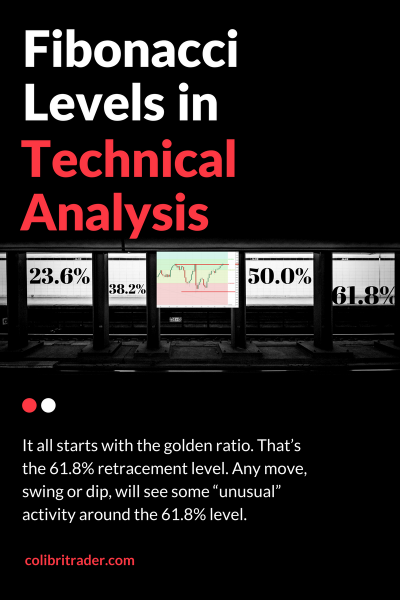 Again, without Fibonacci levels, technical analysis would not exist. The first assumption is that the 3rd wave in an impulsive move will follow. Because traders don’t know for a fact if the 2nd wave ended here, they look for the possibility of the 2nd wave to form a running correction. The key comes from the technical approach used. Look at the previous chart. The Fibonacci tool isn’t dragged from top to bottom. Yet, the 61.8% area proves to be correct. How come? However, there’s a catch. The end of a wave is not always its lowest or highest point. Hence, the derived Fibonacci levels differ. Side Note: Don’t use any level more than two times for a trade in the same direction. In the previous chart, the double bottom’s measured move points to the 50% retracement level. Obviously, until then, the 38.2% may act the same way the 23.6% did. That’s the alternation in patterns: double bottom in the first case, head and shoulders in the second one. It is like the market screams in your face the two pairs want to move to the next Fibonacci level. Thank you Stephen! Is there anything you would like to learn about that is not talked about yet on my website? Thanks Stephen! Always my pleasure. What else do you want to read about?